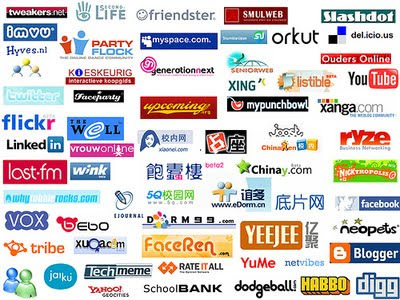 the Social Networking Sites (SNS) have become an integrated part of our lives today. almost every individual who has access to the internet is a part of atleast a couple of SNSs. A survey has shown that one of the reasons for the growing number of divorces among young couples these days, is that the wives are upset about their husbands spending very little quality time with them and a lot of time tweeting and updating their facebook profiles from their blackberrys!!! If this is not a valid reason for a divorce then what is??? The whole concept of SNS is an excellent idea... helps people in a lot of ways. but the way it's used these days, is what makes it completely lame. rather it makes the users 'LAME-O's. And I need not mention the problems created by these sites these days... ooops!, am not talking politics here. but we all know the truth. Rich people/celebrities/famous people use the Social Networking Sites as a tool, not to express their thoughts, (which is the very purpose), instead to gain some cheap publicity and create problems. When an actor tweets "i took a long and comfortable ride in my new xxxxxx car today", and for which the company which owns the brand xxxxx pays the actor (which happens btw), that is an absolutely acceptable healtthy marketing strategy the company is following. No problems with that. But when the celebrities are 'over expressive' in expressing their thoughts etc which could have an adverse effect on the society and hence create chaos, confusion etc, then it becomes a problem...! The worst hit are the young people, who are already sucked into these SNSs. Anything is acceptable when taken/done in moderation. this is applicable for almost everything. Food, alcohol, medicine, advice etc. perhaps, after a certain point we lose interest in it. say the feeling when we are eating the 9th chapathi or the 9th slice of pizza in a row. This is the concept of 'diminishing marginal utility'. But this theory does not seem to apply in the case of SNS. the more, people use it, the more, they want to use it...! The only thing which can make people lose interest in a networking site is, another new networking site! mindlessly wasting time building your own virtual farm, growing pigs, crops etc and doing it a lot. uploading whole folder full of pictures and doing it after every time you take new photos. if you are a multiple SNS user, copy-pasting the same post in all the sites and that too, every time!!! If you have not done even one of the above mentioned things, then you are using SNSs the way it is meant to be. please dont change. The sns is simply a port of the existing act of idling away time, gossiping or looking for an impersonal alternative where exit is only a mouse click away...humans were not exactly more satisfied before sns, they simply had less avenues to crib in. No doubt, sns has become pandemic in nature, but it is quite likely that within a decade, sns usage will drop drastically. also, times like recession or boom give people lots of free time, and easy access to internet does not help alleviate the phenomenon. AWESOME POST! I'm glad to see someone write about how a social network properly works. Thank you! It looks as if this entire post is self directed !! But have to admit, your best post till date ! Hats off !!! Well I'll accept you dint grow pigs... but thats cos u were feeding urself and growing into a little piggie!!! Sasi.. dude.. you are probably the biggest fan of SNS! I'm a little piggie oink oink oink! I kinda felt "Lame-ing" and "Lame-O" was rather lame. @ kartrak: u are totally right. @gig: I know machi! bear with me.